length of path is greater in the first case than in the second. We can easily appreciate the fact that the time is greater in this case, l>y considering a man rowing in a boat, first in a smooth pond and then in a river. If he rows at the rate of four miles an hour, for example, and the distance between the stations is twelve miles, then it would take him three hours to pull there and three to pull back — six hours in all. This is his time when there is no current. If there is a current, suppose at the rate of one mile an hour, then the time it would take to go from one point to the other, would be, not 12 divided by 4, but 12 divided by 4 + 1, i. c., 2.4 hours. In coming back the time would be 12 divided by 4 — 1, which would be 4 hours, and this added to the other time equals 6.4 instead of 6 hours. It takes him longer, then, to pass back and forth when the medium is in motion than when the medium is at rest. We can understand, then, that it would take light longer to travel back and forth in the direction of the motion of the earth. 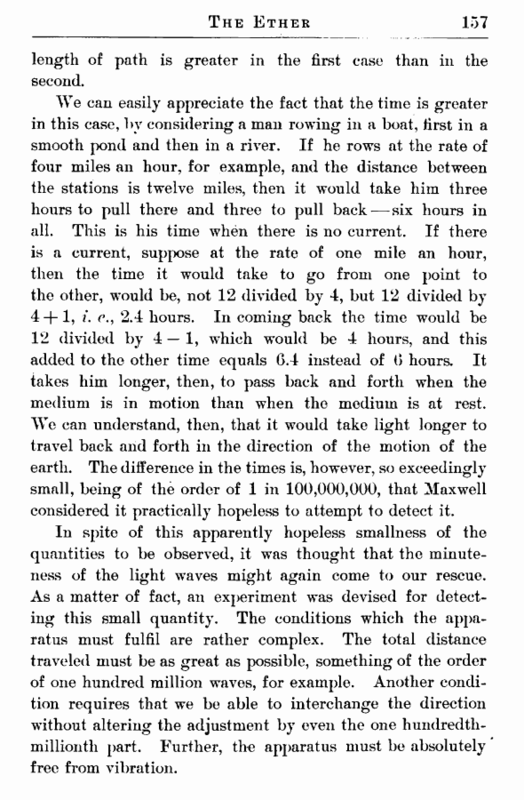 The difference in the times is, however, so exceedingly small, being of the order of 1 in 100,000,000, that Maxwell considered it practically hopeless to attempt to detect it. In spite of this apparently hopeless smallness of the quantities to be observed, it was thought that the minuteness of the light waves might again come to our rescue. As a matter of fact, an experiment was devised for detecting this small quantity. The conditions which the apparatus must fulfil are rather complex. The total distance traveled must be as great as possible, something of the order of one hundred million waves, for example. Another condition requires that we be able to interchange the direction without altering the adjustment by even the one hundredth-millionth part. Further, the apparatus must be absolutely free from vibration. The problem was practically solved by reflecting part of the light back and forth a number of times and then returning it to its starting-j)omt. The other path was at right angles to the first, and over it the light made a similar series of excursions, and was also reflected back to the starting-point. This starting-point was a separating plane in an interferometer, and the two paths at right angles were the two arms of an interferometer. Notwithstanding the very considerable difference in path, which must involve an exceedingly high order of accuracy in the reflecting surfaces and a constancy of temperature in the air between, it was possible to see fringes and to keep them in |>osition for several hours at a time. These conditions having been fulfilled, the apparatus was mounted on a stone supjx>rt, about four feet square and one foot thick, and this stone was mounted 011 a circular disc of wood which floated in a tank of mercury. The resistance to motion is thus exceedingly small, so that by a very slight pressure on the circumference the whole could be kept in slow and continuous rotation. It would take, perhaps, five minutes to make one single turn. With this slight motion there is practically 110 oscillation; the observer has to follow around and at intervals to observe whether there is any displacement of the fringes. 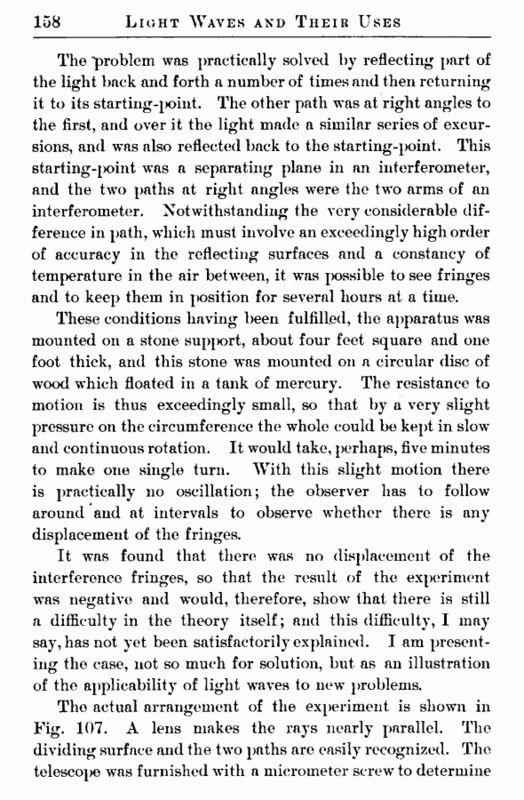 It was found that there was no displacement of the interference fringes, so that the result of the experiment was negative and would, therefore, show that there is still a difficulty in the theory itself; and this difficulty, I may say, has not yet been satisfactorily explained. I am presenting the case, not so much for solution, but as an illustration of the applicability of light waves to new problems.